At the Victory Parade over Red Square, for the first time, viewers will see one of the most secret aircraft of the Russian Aerospace Forces – the newest A-100 “Premier” long-range radar detection aircraft. This vehicle, created on the basis of the Il-76MD-90A military transporter, can simultaneously be called a reconnaissance aircraft, a flying radar, and even an air command post. He first flew into the sky in November 2017 from the airdrome of the Taganrog Aviation Scientific-Technical Complex named after G.M. Beriev. This event in the Russian aviation have been waiting for many years. In modern war, an enormous role is assigned to electronic and radio equipment. For reconnaissance, control, and counteraction, they need modern radar patrol and guidance systems, such as the A-100 Premier. 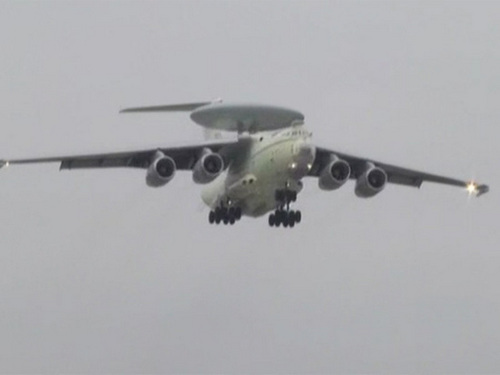 Today, the Airborne Forces of Russia has 19 long-range radar detection aircraft. Basically, these are still Soviet “Awaxes” A-50, four of which have been modernized to the level A-50U. For comparison: in the US Navy today there are about 80 E-2 Hawkeye long-range radar detection aircraft, and another 32 heavier Boeing E-3 Sentry aircraft are in service with the air force. According to military experts, in modern air combat a significant advantage will be given to that side which, with the aid of long-range radar detection, is capable of providing greater control over airspace. Moreover, even if this side will have a smaller number of fighters. In addition, the actions of front-line bomber aviation are also becoming much more effective in the conditions of its control from an onboard radar detection aircraft. And here, until recently, the advantage, as can be seen from comparative figures, was not on our side. Moreover, our A-50 is seriously outdated. They are far from being a new element base, which is why they see the targets worse – airplanes and cruise missiles – made using the technology of reducing radar stealth, which the Americans are focusing on. Advanced versions of the long-range A-50U radar detection, according to experts, can also be regarded only as a transitional version to more advanced versions of such an aircraft. This version just became the newest A-100 “Premier”. It has absolutely unique characteristics, most of which are strictly classified. It is only known that a multifunctional onboard radio engineering complex is installed on board the aircraft – this is a total of about 20 tons of unique electronic equipment. Radar “Premiere” can simultaneously see, classify and track up to 300 different targets at a distance of up to 650 km. Information about them is immediately transmitted to the participants of the combat operation – to command posts for targeting ground and ship-based anti-aircraft missiles, as well as fighter aircraft. The aircraft has a digital navigation system and a dual-band locator with a phased antenna array. It can continuously be in the air for more than six hours. The A-100 itself is protected from enemy air defenses by special target-traps and an electronic suppression system, which is capable of independently interfering with enemy radar stations. Military experts believe that in terms of the characteristics of the new A-100 Premier, not only is not inferior to the modern American intelligence complexes AWACS and JSTARS, but in many ways even surpasses them. At the same time its cost is much lower. The need of the Russian Aerospace Forces A-100 Premier aircraft is estimated by specialists at 15–20 units, subject to the further modernization of the obsolete A-50s. In accordance with the plans announced by Defense Minister Sergei Shoigu, the first serial A-100 should be put into service in 2020. A shown – this year in Red Square.